Two months and eight days into this tumultuous election year, Donald Trump and Hillary Clinton hold commanding leads for the presidential nominations of their respective parties. It is not difficult to explain Clinton’s success. Democrats have grown accustomed to her face in the White House, the Senate and on the international scene. Voters who knew her face and wanted her to be president were not sufficient to enable her to defeat Barack Obama for the 2008 Democratic nomination. After eight more years in the public arena, Clinton’s political identity is more fully formed, and her financial backing more firmly fixed by her favorability rating on Wall Street. Clinton now appears poised to win the Democratic nomination. Trump’s victory at the Republican Convention, also appears almost certain. Like Clinton, he is a familiar face. He gained familiarity as a (for real) billionaire television star who played an uncouth talk show bully. In the political arena, Trump has honed that same image to emerge as a successful (still for real) billionaire uncouth political bully. One Israeli media commentator who has covered and analyzed his own local share of uncouth bullies in political office, has written a succinct and on-target explanation as to why and how, Donald Trump emerged. Ari Shavit is a senior correspondent at Jerusalem-based Haaretz and a member of its editorial board. In a recent column on the U.S. election, Shavit offers three reasons why a billionaire like Trump, with no political background, has risen so high and so fast in his race for the presidency. To begin, Trump is a political demagogue in the American political tradition of demagogues who emerge to confront and over-simplify what a portion of the population has been taught to fear. The first reason for Trump’s success is fear for the nation’s identity. American demography is changing fast. White Christian America is becoming a minority. In the two election campaigns won by Barack Obama, American politics celebrated the change. Now comes the reaction. Something dark and horrible is rising from parts of the conservative white population, which feels it’s losing its hegemony over the land it has built. Shavit writes that Trump’s ability to tap into economic fear is the second reason for his political success. Shavit examines the history of that fear. In the last 30 years American capitalism has become rapacious as it hasn’t been since the end of the 19th century. Massive concentration of capital, huge social gaps and an eroding middle class are breaking the American dream to bits. In the absence of real mobility and the lack of confidence in a better future, American stability and optimism have been undermined. 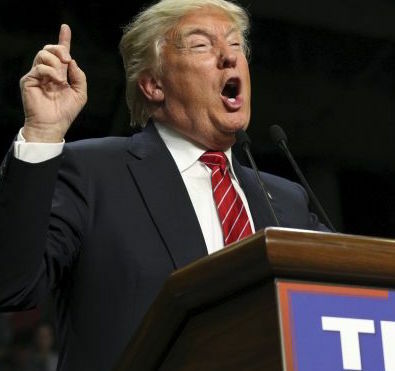 Shavit continues with a third reason to answer the questions, why and how Trump? The third reason for Trump’s success is fear of decline. All those who will be voting in the November election are children of the American century. They grew up in a world dominated in one way or another by the United States. But in the last 15 years these voters have seen America lose its place of leadership in the world. China’s rise, Russia’s provocation and the Middle East’s despair prove that Washington is no longer in command of the world as it was in the past. Thus was created the yearning for a new commander, an unrestrained one. Shavit finds that these three deep fears–fear of the loss of identity, economic fear, and fear of decline–have coalesced in recent years to “become a quiet dread”. While on the surface, the economy seemed to be more or less recovering, the world more or less peaceful, and life more or less reasonable – down below this dread gripped the heart of the American masses. In the lack of job security, communal security and security in the future, the dread intensified. Senator Bernie Sanders could still emerge as the Democratic nominee in November. His upset victory in Michigan Tuesday showed his potential. For Sanders to overtake Hillary, however, would be as surprising as Trump’s sudden transformation from talk-show host to almost-certain presidential nominee. Sanders’ supporters share with Trump supporters a passionate attachment to their candidates. Those of us who fought in the 1972 Democratic convention to give Senator George McGovern the nomination, remember well how passion can go a long way in politics when there is a cause and an inspiring candidate to lead that cause. We also remember how difficult it is to confront a fixed establishment invested in an establishment candidate who is also an incumbent president named Richard Nixon. If Hillary Clinton is the Democratic nominee she will run as the establishment candidate while Trump will run in the passion lane. Given Sanders’ background as a revolutionary, a Trump-Sanders general election would have put two opposites in the ring, both of whom would appeal, from different directions, to the passions that emerged out of the 1960s U.S. cultural/political revolution. As a college student and a confirmed radical, Bernie Sanders was a fighter in that revolution. He fought on its cultural front lines, specifically to undermine the hegemony of the white ruling class. Sanders marched and protested. In 1963, he was arrested during a civil rights protest demonstration, (right) on Chicago’s South Side. He later became a successful politician, moving from mayor to U.S. Senator. To be successful in a November general election, Sanders would need to address the fears of Trump supporters who, in Shavit’s terms are part of a “conservative white population, which feels it’s losing its hegemony over the land it has built”. It is the establishment candidate’s task to persuade the voters that addressing their fears is best left to the establishment candidate. Will a Clinton-Trump November race produce a winning establishment candidate named Clinton, or will passion provoked by fears produce a winner named Trump? That is a question to ponder. There are still primaries and caucuses and two conventions ahead before we reach November 8. On that date, voters must decide who best to lead this nation in a time when so many are gripped in a “quiet dread”. The picture of Donald Trump at top is from Reuters. 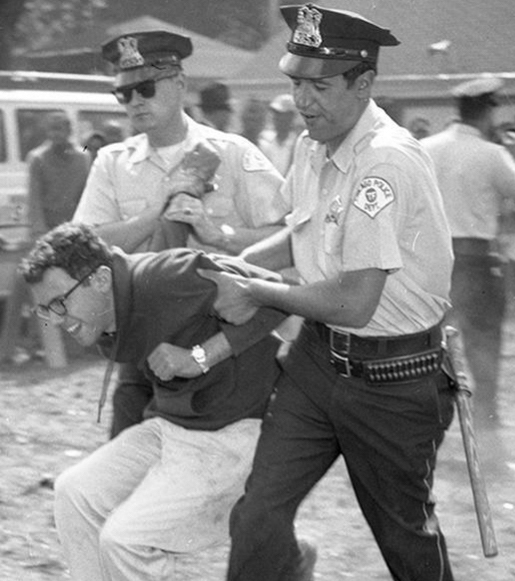 The picture of Bernie Sanders being arrested as a young man in 1963 at a Chicago South Side protest demonstration, is from the Chicago Tribune archives. It was posted by www.democraticunderground.com. This entry was posted in Bernie Sanders, Donald Trump, Hillary Clinton, US govermemt. Bookmark the permalink. 10 Responses to Questions From Israel: How and Why Trump? I think Roy should throw his hat into the ring! Thank you, Jim for a thought provoking article. Who will win, the establishment candidate, supported by Big Money, or the passion candidate, relying on provoked fears and his own resources? I wonder how the Zionist Lobby and pro-Israel Neocons will influence the game? They must have already come to the conclusion that Trump will not carry on their wishes, and Sanders will not dance to their tune, either. If this assumption is correct, then it seems to me that they will do their utmost to ensure that Hillary, first, beats Sanders, and in November defeats Trump. Does this mean that sometime between now and November, the “anti-Semitic” smear will start poking its head? Leave it to that liberal East Coast Zionist to finger the American angst about Caucasian decline in the US. The lection for today has Jesus warning his followers against the yeast of the Pharisees and Herodians (the purity party and the nationalist party in his society – Mark 8:14ff). Jesus would rather have his disciples mix it up with the down-and-outers, sinners, the oppressed and despised, showing them a better way to live, believing that his Way is the Way to go. Mr. Trump’s siren call to be a bully Republic as the Ugly American is the wrong trumpet to follow. Besides, that era is dead. We are now One Nation in a growing world of Other Nations, trying to find a way to empower all workers, all citizens of an increasingly globally interconnected world. American and Israeli “Firsters” have had their day. We now have to make way for “others” and a spirit of “we are in this together”. 178 people die in America everyday from drug overdoses. We are addicted to a sense-sate culture. No one makes it “alone”, with Me, Myself and I. Mr. Trump embodies that spirit: thus both his appeal and the peril that goes with it. Quo Vadis? for fighting for black civil rights. brave actions on the front lines. Thinking of Foreign Policy, I could no more stomach a Hillary victory any more than Cruz or Rubio. The State Department would de facto be directed from Tel Aviv. Say what you want about Trump, but he opposed the invasion of Iraq, while Hillary supported it, the New York Times promoted it, the Likud demanded it. and Wall Street favored it. Trump wants to be an ally of Russia. Hillary prefers the neocon view of Russia. The question here is America First, the same as the supporters of Mme Le Pen love France more than the European Union, or the New World Order, as the Bilderberg Group wants, — open borders, mass migrations, free trade which ships jobs abroad, destruction or weakening of nation states, and regional or one-world currency and government which gobbles up countries like Greece. Normal, even-handed relations with both Israel and Iran are in the national interests of the United States, which is what Trump favors, and Hillary opposes. The problem with Trump is his style, not his substance. I hope he improves his style. I like what he does, not the way he says it. — J. R. G.
Jim, if you’ll allow it, I’d like to respond to Jack Graham. Jack, if I thought Mr. Trump might bring something new to the Isr/Pal table, I might have to think twice about jumping off his noisy bandwagon. I’ve read up on his views in re I/P and find them perplexing to say the least. As a deal-maker he is coy, not wanting to “tip his hand” by favoring one side or the other. In December he stated it seemed to him that it was more up to Israel than Palestinians whether a “deal could be made”. Would he be able to do what 60 years of American-led diplomacy has failed to do? Bibi is leary that the GOP “firewall” he thought he had is eroding with a Trump candidacy. Trump doesn’t seem to be as lock-step support of Israel as, say, Cruz or Rubio. (I’m thinking my preferred candidate, John Kasich, would be in the standard pro-Israel camp). Trump does seem to be preferred over Clinton, who is beholden to the neo-cons and pro-Israel traditionalists around the country. I’ll grant you that. Unfortunately, I disagree with your sense that it’s just a matter of improving his “style” or manner. It’s NOT an issue of style; it’s an issue of substance. Do you want a circus ring-master at the head of the parade? A showman whose character is suspect? I fear he is a neo-fascist who wants to put America First, beating up on anybody standing in the way. Is that what you want? Shoring up the American Empire (in cooperation with the Israel juggernaut?) might be what a lot of Americans want. Are the Israelis willing to part with the Zionist dream of dispossessing the native inhabitants or will they ever be willing to share the land with them? (The Israeli fear of being annihilated, borders on the pathological.) Trump may be a persuasive deal-maker, but that is really asking a lot Any test of Presidential mettle will be whether the US will continue supporting the settler/colonialist regime that has prevailed there since at least 1947. President Obama is trying to negotiate the next 10-year aid package right now – along with VP Biden, in Israel right now, who seems to be toeing the Israeli line vs. President Obama. Right now, it’s the difference between Tweedledee and Tweedledum. We are asking nothing of the Israelis in exchange for our “support”. We support Israel at the expense of justice for the Palestinians. That has always been our position from Truman on to the present day. Will a President Trump be any different? The Israelis want $4 bill/year; Obama is trying to settle for $3.7. Who are the real deal-makers in this world? The Israelis or Trump? After Michigan’s primary yesterday (I’m writing from Michigan), it looks like Trump just might have the chance to try his hand at it! Trump is the best option out of all the options. He craves difficult impossible deals. He will try for sure. Cruz and Rubio are rubber stamp Israeli supporters. Obama and Hilary are both wimps. Trump wanted to be neutral until attacked in an attempt at embarrassment by Rubio and Cruz.Trump has a huge ego which hopefully will bring a huge confrontation with Bibi. He also does not like to be on the wrong side of any balance sheet including that of Israel. He has a 10% chance of bringing peace. Sanders 5%. The rest of the candidates have a zero chance. My vote in desperation will go to Sanders first and Trump second!